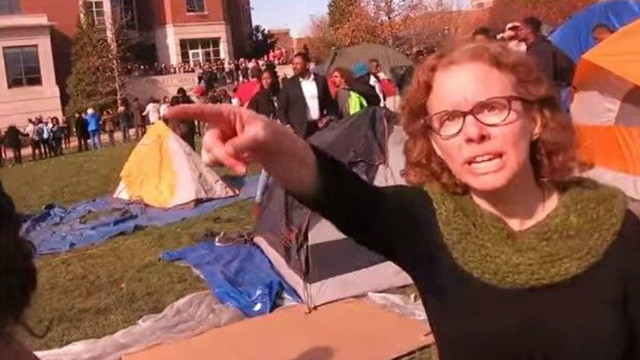 (NaturalNews) As the radical leftist campus agenda of political correctness collapses into despotic lunacy, the University of Missouri takes center stage with its own brand of home-grown loons in the form of media communications assistant professor Melissa A. Click. This professor, who researches academic gems such as "the impact of social media in fans’ relationship with Lady Gaga" was caught on video accosting an ESPN photo journalist, then verbally calling for "muscle" (i.e. fellow Mizzou gang bangers who hate America and the First Amendment) to get physical with this journalist and forcibly remove him from the public sidewalk where he was photo-documenting the insanity for his employer. Naturally, if any white university staff had done anything close to that against a black student, there would be campus-wide solidarity marches decrying the "violence" being committed against black students. But because this victim happened to be a non-black journalist, threats of physical force and verbal abuse unleashed against him by Mizzou staff is all politically correct and "tolerated" by Mizzou itself... a university where spines and scrotums are now banned by policy. The University of Missouri is crumbling into nothing less than a racist totalitarian regime of loony lefti-wing extremists and instigators of violence against journalists and anyone who still believes in the First Amendment. Perhaps Columbia, Missouri, should rename itself "Looneville" in honor of this new left-wing madness that has infected and infiltrated its university. When the very professor who teaches students about the media is caught in public demanding the censorship and forced removal of a photo journalist from a public sidewalk paid for by taxpayers, you know something has gone off the rails at Mizzou. One day, these spineless, intellectually vacuous professors are going to have to wake up and face the monsters they've created by teaching anti-American, radical leftist P.C. nonsense to the student body. And to think, this is all exploding over reports that one black student felt "unsafe" because some drunk pricks yelled a racial slur at him from a moving vehicle. Wow. I remember a time when my black college friends actually had backbone and would tell me stories of their own rare experiences with racial slurs, usually followed by something like, "So I screamed back at them, 'F--k you, cracka!' And now I'm gonna graduate with a degree and make something of myself to show how wrong they are." But not today! Today the University of Missouri is filled with pathetic, fragile and "coddled" young adults who have been propagandized by a patronizing institution of fraudulent education that has indoctrinated them into a wildly distorted worldview in which they believe the world is a welcome place full of warm and fuzzy collectivists who are going to cater to their every whim and wish. FYI to people of color: A few racial slurs blurted out by drunk asshats doesn't mean the university itself is a racist institution. What it really means is that drunk college students act stupid. Gee, really? Never would have guessed that. As the truth about all this comes out -- as we've now witnessed with assistant professor Melissa A. Click turning into a raging anti-freedom tyrant -- it's ugly as hell and shows the total failure of our nation's universities to prepare students for anything resembling the real world. If you're a black student at Mizzou and you think you're not going to face real adversity after graduating, you're delusional. The world is a vicious, malicious and often unfair place regardless of your skin color. Sadly, it's assistant professors like Melissa A. Click who are utterly failing to prepare you for the real world by coddling you in a protective bubble of artificial political correctness and "sensitivity training" that the rest of the world largely laughs off as a P.C. joke. When "tolerance" is caught on video at Mizzou, it looks exactly like a ranting, screaming professor threatening a photojournalist with physical violence. 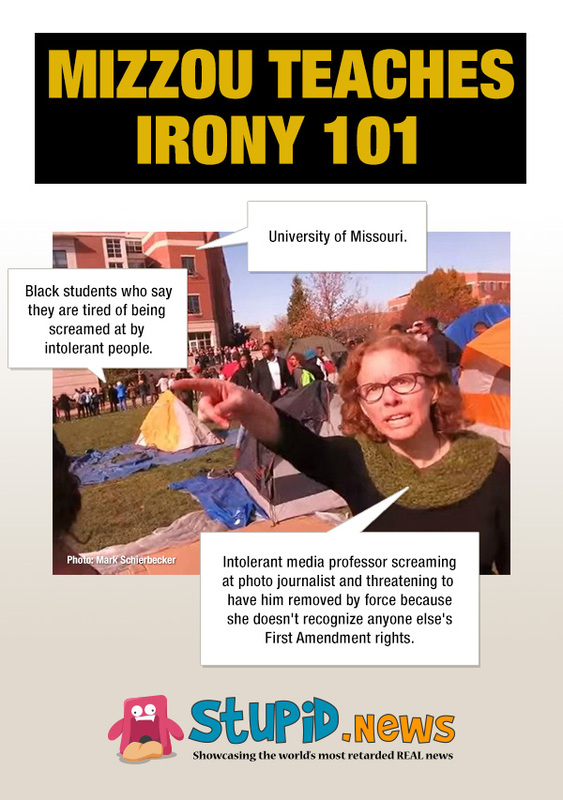 That's the extreme radical left on display, making Mizzou look exactly like the loony leftist indoctrination institution it has sadly become. Parents, don't let your kids attend Mizzou. They'll be turned into screaming loonbags who hate the Bill of Rights and threaten people exercising their First Amendment right to free speech. On a day of chaos at the University of Missouri — where both the school’s president and chancellor resigned after weeks of campus disruptions by students inspired by the Black Lives Matter movement — was also a day of media censorship. Following in the media-hostile tradition of Black Lives Matter, a student journalist named Tim Tai, who was working for ESPN, was accosted and intimidated by the crowd, who attempted to block him from doing his work. When he pointed out he had the right to be there, the mob continued to surround him and other journalists trying to report on the University of Missouri story. 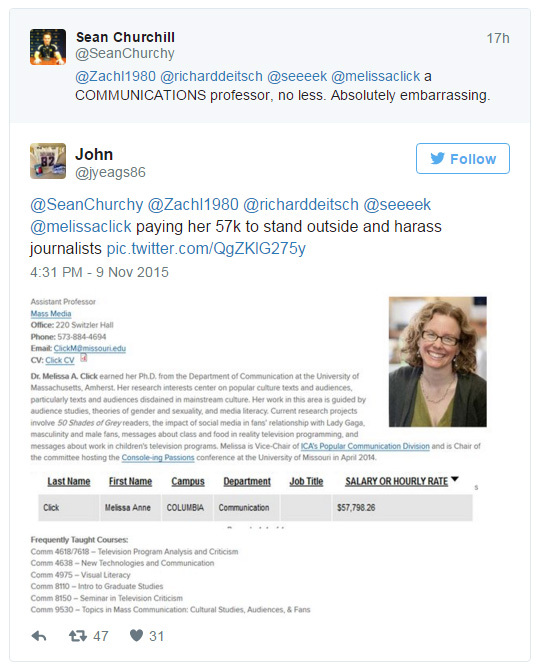 However, as a Twitter user pointed out, the woman calling for muscle is none other than University of Missouri Communications Assistant Professor Melissa Click. Dr. Melissa A. Click earned her Ph.D. from the Department of Communication at the University of Massachusetts, Amherst. Her research interests center on popular culture texts and audiences, particularly texts and audiences disdained in mainstream culture. Her work in this area is guided by audience studies, theories of gender and sexuality, and media literacy. Current research projects involve 50 Shades of Grey readers, the impact of social media in fans’ relationship with Lady Gaga, masculinity and male fans, messages about class and food in reality television programming, and messages about work in children’s television programs. Melissa is Vice-Chair of ICA’s Popular Communication Division and is Chair of the committee hosting the Console-ing Passions conference at the University of Missouri in April 2014. Melissa’s excellence in the classroom has been recognized by the MU Chancellor’s Committee on the Status of Women (Tribute to Women, 2004), the Intercollegiate Communication Association/iCom (Outstanding Professor, 2007), MU’s College of Arts & Sciences (Purple Chalk Award, 2007), Lamda Pi Eta (Honorary membership, 2008). In 2010, she received the Provost’s Outstanding Junior Faculty Teaching Award. MU’s Association of Communication Graduate Students have recognized her as an “Outstanding Mentor” (2011) and as “Graduate Advisor of the Year” (2013). No word on whether Ms. Click will face sanctions or face criminal prosecution for her actions, or whether she will be teaching a course in Introduction to Sick Irony 101.